Although I do not bill myself as a forecaster, my generic inflation forecast has remained remarkably accurate: expect it to stick around 2%, barring a recession. Although this has been the correct forecast for years, it does not match what people want to hear: higher inflation (or deflation!) is around the corner! (This generic forecast is for the United States and Canada, but I will stick to U.S. data for this article.) To a certain extent, the entire social position of mainstream economics is based on their ability to sound very serious about inflation, and just saying that inflation will probably stick around 2% does not sound serious at all. This article is an update on my views on inflation, which obviously have not moved very much. The chart at the top of this article summarises the situation excellently: despite years of hyper-ventilation about Quantitative Easing, "unsustainably low" interest rates, or an unemployment rate below NAIRU, the most domestic economy-focused price measures (average wages, core CPI) are going nowhere. The complete lack of a rebound in average hourly earnings stands out versus previous cycles. The growth rate has barely reached 2.5%, while it was running at 4% during the previous two cycles (when inflation was still close to the Fed's implicit target). The fact that the growth rate for average hourly earnings could rise by about 150 basis points and be consistent with CPI inflation rates that remain near the Fed's target probably tells us all we need to know about the debates regarding the level of the unemployment rate and inflation. Even if we have reached "full employment", wage increases need not translate into higher consumer price inflation; those higher wages could just reflect workers getting a larger piece of the income pie. 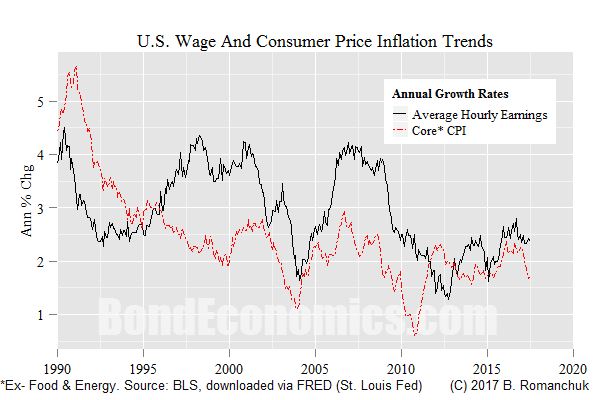 I would note that the limited importance of wage inflation for consumer price inflation in the current context does not mean that it does not matter for the level of nominal interest rates. Although central bankers take pains to claim neutrality in the struggles between labour and capital, any realistic appraisal of the situation shows that central banks have their thumbs on capital's side of the scale. Rising wages are met with rising interest rates; rising profits -- not so much. In other words, rising wages will cause an instinctive set of rate hikes by the Fed, even if there is no danger of consumer prices rising. However, there are times when we just want to be able to forecast inflation (such as breakeven inflation trading), and so I am just discussing inflation, and not nominal interest rates. Unless there is some major break in current trends (a recession, or a structural change that leads to higher inflation -- which I do not see as likely), the overall inflation rate will remain in a range around current levels (which is completely unlike the situation in earlier eras, such as the 1970s). The movements in CPI within the range will depend upon what is happening to the components of the index. The relative stability of average wages and core CPI mask the divergences that we see within the CPI index. The chart above shows the inflation rate for the services and goods ("commodities") components of CPI. Since energy prices show up in the goods component, goods inflation has been highly volatile. That said, it looks like services inflation has been higher on average. The chart above shows the divergence in inflation rates in a more systematic fashion. 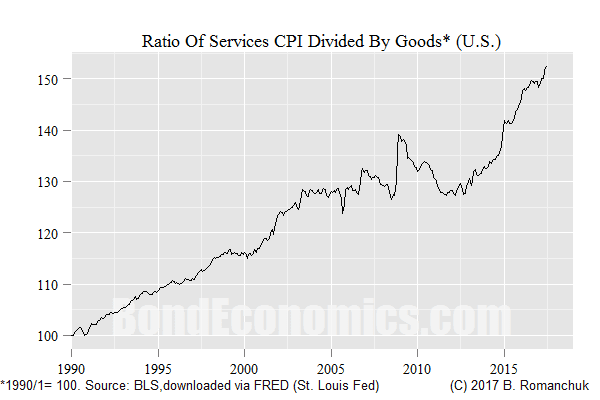 The services component of CPI has been outrunning the goods component fairly systematically since 1990, with a bit of volatility around the Financial Crisis and its aftermath. This tendency is well known; manufactured goods prices have been held down by greater productivity, and the effect of cheap imports as a result of outsourcing. Meanwhile, many segments of the services sector have had pricing power, notably in health care, education, and rents. 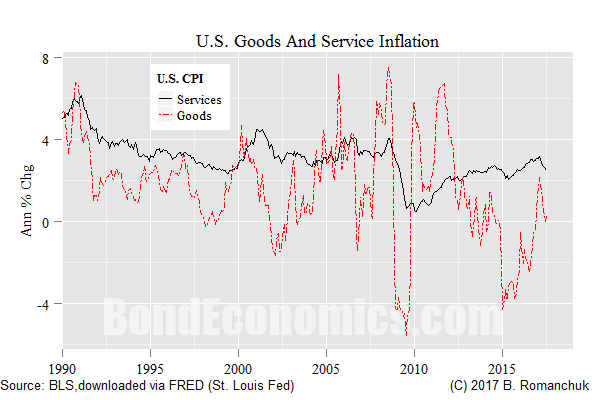 The systematic divergence between goods and services inflation is curious from the perspective of mainstream theory that argues that inflation has been stable as a result of private sector actors setting price hikes to match the desires of the central bank (the inflation target). Although overall inflation has been relatively close to target since the early 1990s (with only the systematic miss to the downside after the Financial Crisis), it is difficult to find any sectors that set price increases in line with the inflation target. It seems that it is easier to explain inflation remaining near target as a result of the central reacting to high inflation by inducing recessions with rate hikes, which is essentially backward-looking behaviour. This is an argument that explains observed outcomes well, but it is not particularly welcomed by monetary policy experts. After all, you do not need a doctorate in economics to react to historical data. If we drop the assumption that overall inflation is going to track some aggregate economic variables, but instead is the result of each industry setting prices based upon industry-specific factors, inflation analysis is more complex. This complexity is not completely ignored by central banks; for example, the Bank of Canada monitors a wide range of inflation indicators. The difficulty with disaggregating inflation analysis is that we are left with several partial models, and coming up with statistical tests that will impress academics is difficult. The one area of domestic pricing that appears to be economy-wide are wages. Wages are a major cost for almost all domestically-produced goods and services. This explains the importance of labour market indicators in discussing inflation. That said, it is clear that the labour market is segmented, with some groups of workers in demand and able to negotiate higher wages, while others are toiling in underemployment and have almost no bargaining power. Since there are minimum wage laws, and nominal wages are sticky (nobody likes wage cuts), there is no way for the underemployed segments to compensate for the wage increases in the sectors that are running at higher pressure. This explains why I believe that overall wages are rising despite aggregate underemployment, and why the widespread disagreement on the question whether the Unites States is near "full employment." Turning to the goods sector, there does not seem to be an obvious catalyst for accelerating inflation. 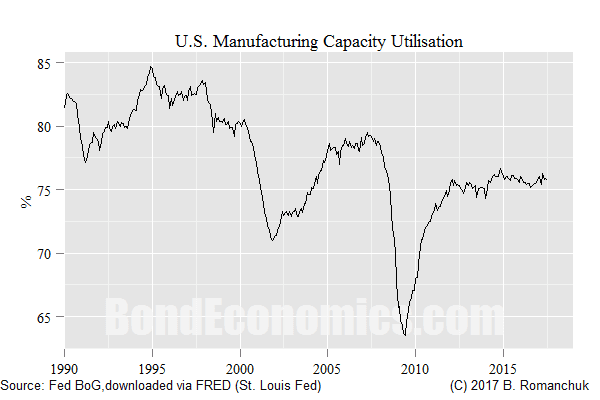 Domestic manufacturing capacity utilisation (above) is mires at a low level, which is actually below the cyclical lows in the 1990 recession. The importance of this indicator has waned along with the fortunes of the U.S. manufacturing sector, but it certainly does not point towards inflation risks. Otherwise, energy prices are the usual culprit for higher cyclical inflation. Although I am in the Peak Oil camp, it seems unlikely that global oil demand will pressure available supply for some time. There is still a considerable amount of high-cost energy available that can be brought online in response to price peaks. For the services sector, the major components have different drivers. Medical price inflation will be influenced by health care reform, an area I have no opinion on. Education inflation is also the result of policy decisions, particularly student loan availability. However, the usual culprit for cyclical services inflation is rent inflation. In the previous two cycles, it had a tendency to accelerate during an expansion. 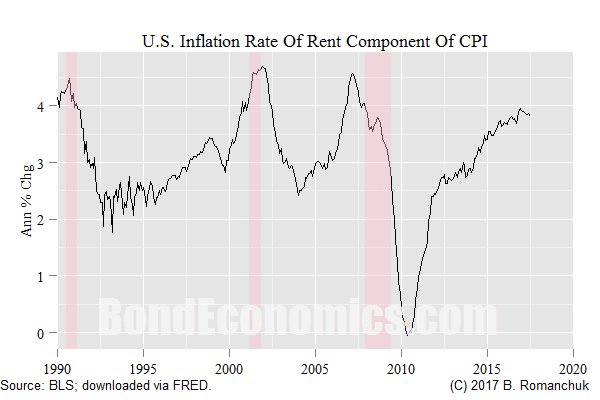 The current cycle is seeing a tendency towards rising rents, and this is probably one area that is most supportive for a high inflation story. Although I believe that there is considerable slack in the labour market, there are pockets of pricing power in the economy. At present, it seems those areas with pricing power are not large enough to cause a dramatic rise in overall inflation. I can't disagree with anything you say. Labor has little bargaining power and oil is cheap. One wildcard is Saudi Arabia. If the SA government collapses, or if SA drops the petrodollar, then oil prices could spike, and for that matter, all imports would cost more. As you point out there are alternative sources of oil -- fracking, tar sands, Venezuelan heavy crude -- that would then kick in. The end of the petrodollar would not necessarily be a catastrophe as some claim, and in fact would benefit domestic manufacturing, but there would be some inflation. Our current president is not necessarily committed to the petrodollar. He wants tariffs, but Congress will not give him tariffs. Well, ending the petrodollar would have the same effect as tariffs.